You’d think that since Jay Cutler can handle unruly fans and hits delivered by Clay Matthews, that taking care of his own kids alone would be a walk in the park. Kristin Cavallari, his wife and reality TV star, shared a text that she received from her husband on Instagram after she returned from a trip after only being gone a few days. 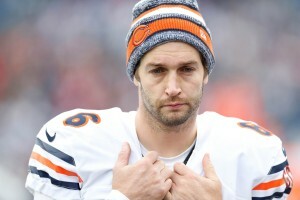 It appears that Cutler was a bit in panic mode after things appeared to not be going his way. According to the photo’s description, the couple do not have any nannies to help them with the parental duties. You’d think that a man who made over $20 million last season could hire at least one nannie. I bet that after this experience, Cutler will probably invest in a few hired hands.